Gwen Stefani kick started another leg of her uber-successful Just a Girl residency in Las Vegas on Wednesday. But, thinking ahead, the single mom of three made sure to leave Thursday free so that she could celebrate her son Apollo's birthday. 'Happy 5th b day to my sweet baby apollo u r a true gift to me from GOD,' the singer gushed in the caption of pictures taken at his birthday bash that she shared on Instagram. From the looks of things, her little boy enjoyed a safari-themed party, presumable in Las Vegas. In one sweet snap, her little boy stood in front of a 'Apollo turns five' poster that included a jungle scene complete with a tiger, giraffe and zebra. 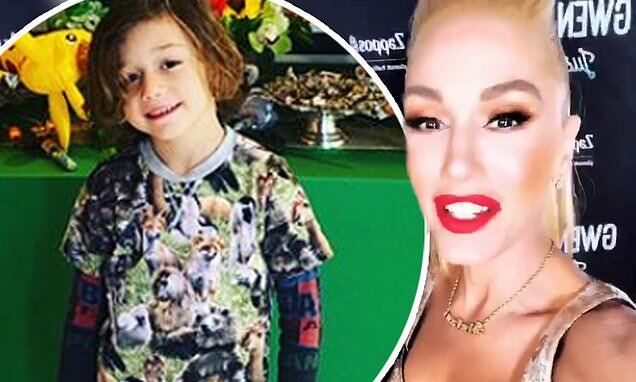 Apollo, whom Gwen shares with ex-husband Gavin Rossdale, flashed a big beaming smile dressed in an animal-inspired t-shirt over a long-sleeved sweatshirt. In another photo, family and friends are hovered around taking photos of the boy with a table-spread of sweet goodies and balloons behind him. Stefani shared a third picture of her boy outside enjoying a sunny day at a Lego playground.